Is it time for a checkup with us? Call our practice to schedule your next visit. Every profession and discipline has its own unique language. Dentistry is no exception. We try to use plain language in our patient explanations. But sometimes we fail. Here are some of the terms you may have heard us use and their meanings. Abutment: A tooth on either side of a missing tooth that supports a bridge or removable prosthesis. Or a piece of metal or porcelain screwed on to an implant to attach a crown. Amalgam: A common filling material for repairing cavities. Made from silver, tin, zinc, copper and mercury. Appliance: Any removable dental restoration or orthodontic device such as braces. Bitewing: A single X-ray that shows upper and lower teeth. Used to check for decay between teeth. Bruxism: The grinding or clenching of teeth, usually while sleeping. Bruxism can result from stress, misaligned teeth, disease or medicines. Calculus: It’s not math! It’s a hard mineralized deposit that forms on teeth. Often stained yellow or brown. See tartar below. Composite: A tooth-colored mixture of plastic and fine glass, quartz or ceramic particles used for fillings. Dry socket: An exposed bone or nerve from a dislodged blood clot at the site of a tooth extraction. Lingual: The surface of a tooth that faces the tongue. Malocclusion: A misalignment of the biting or chewing surfaces of upper and lower teeth. Panoramic X-ray: An X-ray that shows all the teeth in the mouth and the relationship of the teeth, jaws and head. Plaque: A colorless, sticky substance formed from undigested food particles, saliva and bacteria. Neglected, plaque hardens into tartar or calculus. 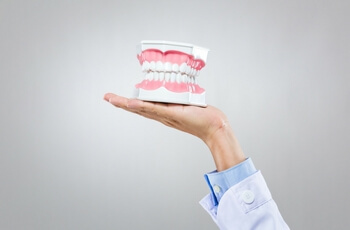 Prophylaxis: The cleaning and polishing of the teeth to remove plaque, calculus and stains. Restorations: A replacement for lost or missing teeth such as bridges, dentures, fillings, crowns or implants. Tartar: Plaque that has formed a hardened deposit that adheres to teeth producing a rough surface that attracts plaque. Veneer: A thin shell of custom-made tooth-col[o]red plastic or porcelain. Veneers are bonded to the front of the teeth to close spaces, straighten teeth and improve appearance. « What’s Involved In an Oral Exam?